I think everyone should know about jerky which seems, until recently, to have been a secret kept by our cousins over the water in the US of A. This is an amazing snack food. High in protein and low in fat and tasty. So tasty. It takes 200g of beef to make 100g of jerky, it lasts forever (well about a year) without needing refrigerating and won’t melt or be crushed like chocolate or crisps. Did I mention it tastes great too? We tried several of the varieties on offer from Wild West Foods and were very impressed by the taste and texture. We particularly liked the spicy hot peppered flavour and the hot ‘n’ spicy flavour. 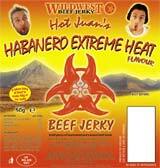 It’s worth mentioning that the “HABANERO EXTREME HEAT” flavour is not for the faint hearted. It tastes great although some of those at Sausagefans.com helping us sample the jerky had tears in their eyes afterwards! If you only try one new food in 2005 make sure it is Wild West jerky. For more information visit http://www.wildwestjerky.co.uk or call 0870 7415948.